The next round of Buzz has begun! Get ready to play a brand new round of Buzz! In our last Buzz! review, Buzz! Quiz TV received an 8.7/10 due to its amazing group gameplay that brought families, friends, and sometimes co-workers together for a few enjoyable rounds of laughter and craziness. There are a ton of changes in this year's show. Some gametypes have been removed while new ones join the roster. New faces have also joined, while past stars have faded out of the limelight. Is this new Buzz! a real winner, or has it lost viewers due to its changes? Find out here. The first notable changes are the graphical improvements. Everything has been polished quite a bit since the last game. There are no longer low quality textures mixed in with high quality ones, and characters models have much more detail. The character models that you see the most improvement in are Overlord and Quiz-Man. Their new suits have been decked out with new flare that actually looks cool, unlike Batman's suit in Batman & Robin, we all know how horrid that suit was. Taunt animations are more fluent, Buzz is more lively, and this is much more of the quiz show Buzz! is supposed to be. The presentation of this game is truly that of a quiz show, and not one of those poor quiz shows that only has one season. Buzz! 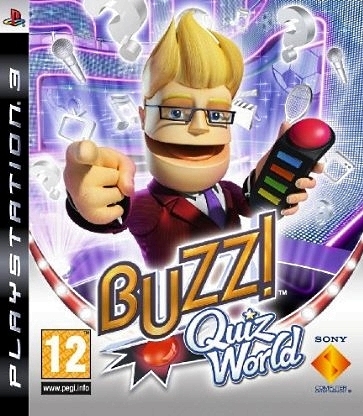 Quiz World has this kind of aura that just says "successful game show" around it even though it's just a video game. It's actually quite amazing that a video game can be better than pretty much all the quiz shows we have on TV now-a-days. This is just presented so well that it's just plain enjoyable. The only negative to the presentation is the new menu system. It's kind of confusing to work at first, but it is easy to learn and you'll soon get used to it. Buzz has received some fresh new insults and one-liners to supplement his dialog. After turning mature content on, Buzz becomes even more comical, and generally mean to his contestants. Buzz is joined by his faithful narrator from Buzz! Quiz TV. He reads almost all of the questions to you. The only questions he won't read to you are the National Geographic quiz packs. His new round introductions are also funny, especially Pie Fight's. Other audio tidbits in this game are all the wacky sound effects for the gametypes and buzzer noises. All the Buzzer noises available are from Buzz! Quiz TV. No new noises seem to have been added, and while this is rather disappointing, with the amount of noises available there really was no need to add anything new. Several of the new gametypes have new, very fitting sound effects, and the older ones seem to have had their own sounds re-recorded with improved audio tracks. Now that the technical stuff has been discussed, let's talk about the most important part of this game. This is of course the gameplay. There are still three different game modes to play - Multiplayer, MyBuzz!, and single player, with some variations and omissions from the last game. Depending on the game mode chosen you can play with up with eight players at one time. Eight players at once can be accomplished both locally and online. Sofa vs Sofa has also changed due to the increase in players, so each family member can have a player slot and fight for themselves and their family. Single player is no longer a fully drawn out game, it is just two challenges that you can play. These challenges being Stop-the-Clock and the new gametype, Over-The-Edge. In Stop-The-Clock you are trying to answer thirty questions as quickly as you can. In Over-The-Edge, you are attempting to answer as many questions as you can before you are dunked into a pool of goo. This change in how single player works is a great improvement over the lonely, boring, and tedious single-player in Buzz! Quiz TV. MyBuzz! quizzes are a more streamlined experience. You can play games with up to three rounds. You can also play MyBuzz! quizzes based on different selections made when starting the game. 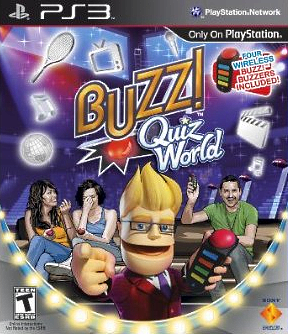 You can play Buzz's choice quiz questions, best rated, and several others. The only problem that still exists is that sometimes it's possible to get one of those trophy quizzes from the last game that people spammed to get the 'ten quizzes wrote' trophy. Finally, the biggest improvement in this game is the multiplayer. 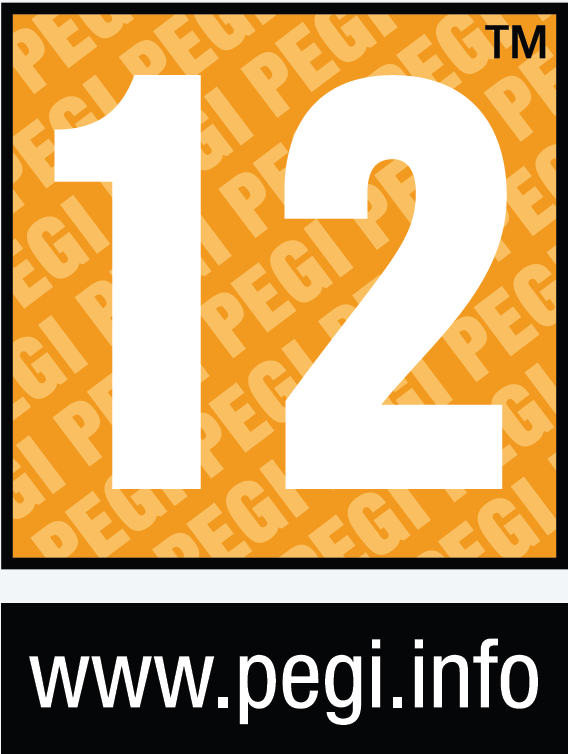 The game supports up to eight individual players at a time. Players can range from eight different families online to just eight individual players. There are a bunch of different ways to play the game too, for example instead of selecting a question category each round you can select what the round will be. There is also a 15 minute four round option and a 45 minute ten round option which will run players through most of the gametypes. 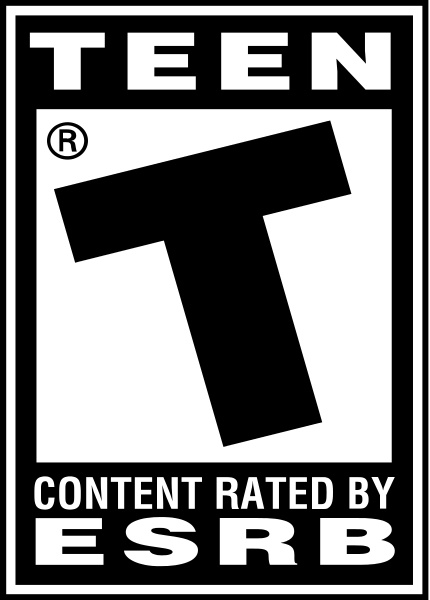 The game "All that Apply" has been removed and replaced by Over-the-Edge, On the Spot, and Boiling Point. Over-the-Edge and Pie Fight slowly reveal the answers to you letter by letter increasing the difficulty. There are now a total of eleven gametypes. The list below this review details each gametype available to be played. At the end of any "show" the winner wins a prize. The game does suffer from some old glitches, namely connection issues. Every once in a while you or your opponent may randomly get booted from a game. Buzz's lines can get rather dull after hearing the same thing multiple times. Quiz World also has one other issue - it takes a long while to earn all the prizes in the game. There is a good chance you will win the same thing several times in a row. I understand making some prizes rare in order to make you work hard for them, but they could have been more effectively randomized. Overall Buzz! 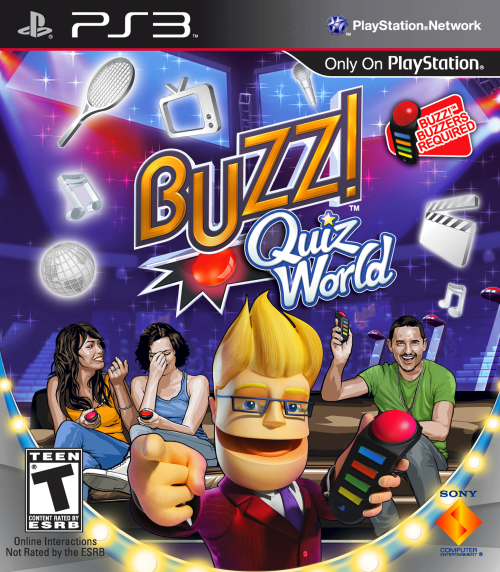 Quiz World is probably the best quiz game available on the PlayStation 3. It has some issues, including ones that still haunt it from the previous game, but luckily they don't really hurt the overall experience. The game itself has been streamlined to be more family oriented, which was a must for this type of game. If throwing parties, playing games with family and/or friends, and testing your smarts against strangers is for you, then Buzz! Quiz World should be on top of your purchase list. It is loads of fun and there are thousands of questions in the game, and even more questions being added with each add-on released on the PSN. Point Builder - Answer each question correctly to increase your score. Stop the Clock - Similar to Point Builder except the quicker you answer the more points you will score. Fastest Finger - Same as Stop the Clock, but first correct buzzer gets 500 points, and it goes from there. Pie Fight! - Answer slowly reveal itself letter by letter. First correct answer gets control of the pie throw. Each player has 2 lives, and you are not safe from pieing yourself. On the Spot - Randomly selecting who will answer the question first, each opposing player bets on how you will score; Definitely = 100 points; Probably = 200, Unlikely = 300; No Way! = 400. Get the question right and win the bet; get it wrong lose points based on opposing bets. Short Fuse - The game of hot potato just with a bomb. Answer quickly, the bomb only has a limited amount of time till it detonates. When the bomb goes off on a player it takes 300 points with it. Over the Edge - A pit of green goo appears in front of the contestants and just like pie fight the answers are revealed to them letter by letter. For each correct answer opposing player's platforms raise one step towards taking the plunge. For every wrong answer, your platform raises. Each player has five chances to win the round. Boiling Point - A thermometer appears behind each player. Each correct answer raises the temperature. The first player to get it six answers answered correct will win the round. Point Stealer - The first person to answer a question right can steal 300 points from opposing players. If an opposing player has less then 300 points, that number will be taken from them. High Stakes - The opposite of On The Spot; you bet on yourself. Highest bet is 500, lowest is 50. The Final Countdown - Points are converted to time, and the platforms raise into the air. Answer quickly and correctly, as the platform will raise for the fastest correct answer. Each wrong answer drops the platform. Once a player hits the bottom they lose. Be the last player to hit the bottom to win. If there is a draw, players answer questions until one player gets one correct.